So it begins – the month protein-rich dishes. The first recipe that I am going to post under the theme is Mashed Green Gram Dal or Patchai Payaru Masiyal as we say in Tamil. It’s a no-onion no garlic, vegan and gluten-free recipe with any soaking time involved. 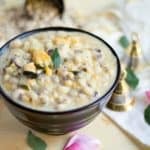 It’s a simple mashed dal tadka/kadaiyal prepared with green gram with the hint of tamarind. 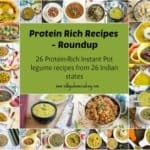 As I posted the theme details and what made me choose this sub-theme of Indian legume-based recipes yesterday, I am not going to explain the same today. So let me get into recipe directly. 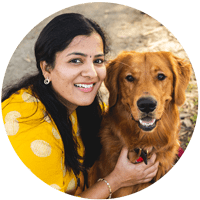 :-) Let’s check out the first recipe, a video one from the state of Tamil Nadu under Instant Pot Indian Legume Recipes. I love and treasure cookbooks. One of my favorite books is “Dakshin – Vegetarian Cuisine from South by Chandra Padmanabhan” Guess what; I got this recipe from that book. It’s one of our staple dal recipes, and somehow I didn’t post it here on the blog. I am glad to post it now under this theme, especially the instant pot version. As I mentioned earlier, you don’t need to soak the dal for this recipe. Be it the pressure cooker version or the IP version; you can just add the dal and cook. But there is no harm in soaking it. If you have soaked the dal, reduce the cooking time. The original recipe doesn’t call for sambar powder. But just to add some spice, I usually add ½ Tsp of sambar powder or rasam powder. (Err; at times I do add rasam powder too) But today for this version I went with sambar powder. That ¼ cup of cilantro is the real secret ingredient in this recipe. I would recommend adding more even. :-) This goes well with both rice and roti, and we usually have this with rice. With just this dal, rice and sutta appalam (roasted papad), and ahh you are in food heaven for sure. According to Livestrong, 1 cup of green moong bean has 14 grams of protein and 15 grams of fiber making it a perfect lean source of protein. I have used 1 tbsp of oil(I know it’s on the higher side), but you can reduce it to 2 tsps or even less and making it healthier and protein rich. 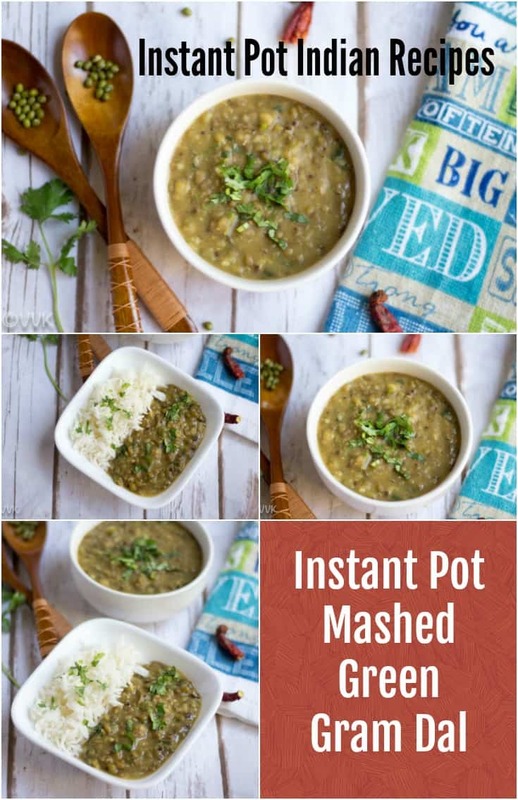 Here is the quick video recipe for this instant pot mashed green gram dal. Please subscribe to my youtube channel and stay tuned for more recipes. 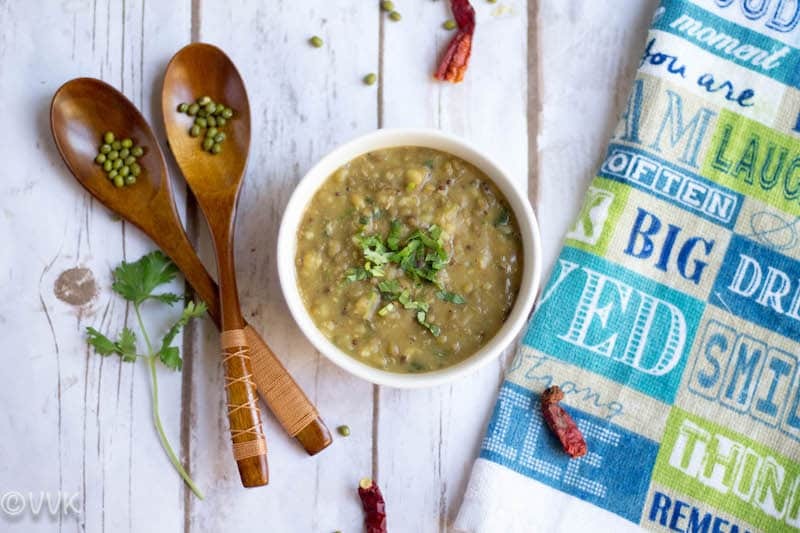 A vegan, gluten-free, no onion no garlic protein rich mashed green gram dal prepared in instant pot, popularly known as pachai payaru masiyal in Tamil. Wash the green gram dal and set aside. Slit the green chili and chop the cilantro and set aside. Dilute two tsp of tamarind paste in 1 cup of water. Set the IP in saute mode and add the oil. Once the oil is hot, add the mustard seeds, hing, red chili, slit green chili and few curry leaves. 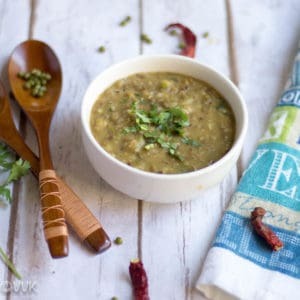 Saute for a minute and as the mustard seeds start to splutter, add the washed green gram dal and combine them. Add the tamarind water and mix well. Now add the sambar powder, salt and remaining 1.5 cups of water and mix. Set the Instant Pot in manual mode and pressure cook for 20 minutes and let the pressure release naturally. Remove the IP lid carefully and mash the dal nicely. Now set the IP back to saute mode and add 1/4 cup of chopped cilantro and let it simmer for 3 to 5 minutes. That’s it. Green gram masiyal is ready. Serve hot with rice and papad. Heat the pressure pan or cooker and add the oil. Pressure cook the dal mix for at least 5 to 6 whistles. Let the pressure subside and carefully open the lid and mash the dal nicely. Add 1/4 cup of chopped cilantro and let the dal simmer for 3 to 5 minutes over medium flame. Adjust the salt and spices as per your preference. You can either increase the chili quantity or the sambar powder. Instead of oil, you can use for tempering. More the cilantro, better the taste. So I would recommend adding at least 1/4 cup of chopped cilantro. Adjust the water as per your consistency preference. That's it. Green gram masiyal is ready. Serve hot with rice and papad. Sounds like a pot full of green moong soup. Can have it just like that – no need of rice. Very interesting recipe. Looking forward to your other recipes in this marathon. Very true. It’s such a heaty dal. Thanks Kalyani. This moong curry is delicious my FIL and hubby love the bean and so they will be happy to eat one more new curry. Same pinch,this is one such comforting dhal,I do make it often with no tamarind.Looking forward to your IP recipes.. Protein packed bowl, love dal chawal. Its mine fav food. So healthy so simple to digest. Yup very true. Thanks Preeti. oh wow thogayala? 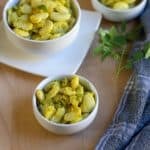 Recipe share panni erukeengala? Between thanks much sharmi. Such a wonderful dish to start the series. Looks like you hit a jackpot with that instant pot..:)..I know this series will be so useful for many! :-) :-) I hope so. Thanks a lot Valli. 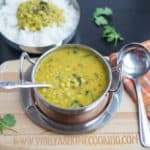 This is such a delicious dal recipe. I make this for Sruti but I haven’t tried with tamarind. Next time I will add some tamarind. Very nice video demo Vidya. Thanks a lot Gayathri. Learning video bit by bit. Mung curry is such a satisfying and healthy curry. I make it once a week with rice. And don’t you love the Instant Pot, such a versatile gadget. No nosy whistles and no baby sitting it too. Oh yeah. I love IP and you put right. No babysitting. Thanks a lot Mayuri. 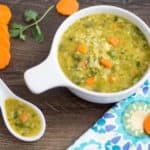 I am an instant pot fan and I love all the recipes made in that. I have never paired tamarind with whole green gram. Will try it sometime. Looking forward to the rest of the recipes for the mega marathon. Your theme sounds prefect to start this Mega marathon. 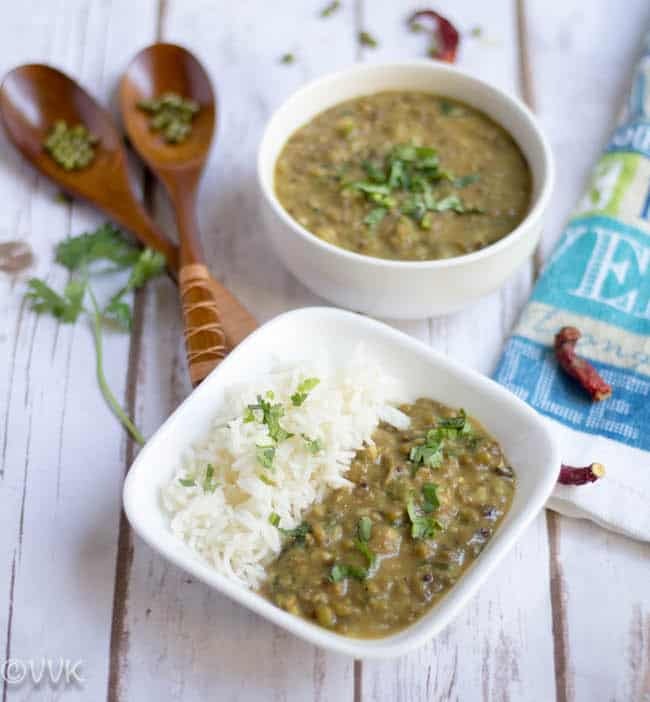 Instant pot mashed green gram dal looks seriously prefect to enjoy with a bowl of rice and some papads. Lovely start Vidhya. Thanks Priya. Glad you liked it. Your theme sounds very interesting and this is a classic start to the marathon. Looking forward to all the other dishes you have lined up. Beautiful recipe ! The green gram is a favourite of hubby and he would be more than happy to have them in a new avatar . Wonderful choice to start the Protein Rich Marathon . We love moong dal with rice but always make it with lots of garlic ginger and tomato, the punjabis way. I love your version and that little sambhar powder must have made a huge difference. Looking forward to your other recipes.